The authors Erica Staehling and Ryan Truchelut are co-founders of WeatherTiger, a weather consulting and seasonal forecasting company. The landfall of Hurricane Harvey marked the beginning of untold misery for the residents of the western Gulf Coast and the conclusion of a very lucky streak for U.S. coastal residents. Then came Hurricane Irma. The back-to-back Category 4 storms ended a nearly 12-year gap between U.S. major hurricane landfalls (Category 3 or above on the Saffir-Simpson hurricane wind scale), the longest such interval since the 19th century. A deeper dive into the historical record shows an even greater measure of good fortune: The past decade has been one of the quietest in terms of total hurricane energy occurring over the continental United States, even as these years were busy overall in terms of hurricane activity over the ocean. When Hurricane Wilma stormed South Florida in October 2005 as the exclamation point on two consecutive brutal hurricane seasons, Facebook required a college email address, there were more than 9,000 Blockbuster video locations, and eight Subway Sub Club stamps still got you a free six-inch sandwich with the purchase of a regular-priced drink. Few expected the quiet period that followed, but as the time between major U.S. hurricane landfalls neared a decade, the tropical cyclone research community began to grapple with the emerging "landfall drought." In 2015, Timothy Hall and Kelly Hereid used a model to estimate that a decade-long U.S. major hurricane landfall drought can be expected roughly every two centuries, as well as to approximate the drought frequencies for other storm intensities and U.S. regions. In 2016, Bob Hart, Daniel Chavas and Mark Guishard demonstrated that the length of landfall drought is sensitive to the arbitrary 111 mph wind threshold that defines a major hurricane, showing that use of other wind speeds or the hurricane's minimum central pressure as the criterion yields a shorter drought. To follow up on Hart et al., we made updated plots of landfall drought length that include Harvey. As in the original study, the impressive length of the landfall drought is dependent on the threshold used to define it. These figures show that the most recent gap between landfalls of Category 3 or higher hurricanes is the longest on record, at 4,324 days, almost double the length of the next-longest gap. However, for Category 2 or higher storms, Harvey ended a long but not exceptional interval of 1,148 days beginning with lightly remembered Hurricane Arthur in July 2014. For Category 4 or higher hurricanes, the 4,760 days between Hurricanes Charley and Harvey is exceeded by a gap from September 1900 to August 1915 and nearly equaled on several other occasions since 1900. Overall, this hints that the just-concluded drought may have had some historical precedent and that the rarity of such a drought in terms of individual storm landfalls is keenly sensitive to the threshold selection. To sidestep the thorny semantics of what constitutes a "major hurricane landfall" (a definition excluding the landfalls of devastating storms such as Sandy and Ike), we studied the drought using a richer intensity measure, accumulated cyclone energy (ACE). ACE roughly quantifies the wind energy expended by a tropical cyclone. A category 3 hurricane yields around 1 ACE unit per six hours, while a weak tropical storm produces around an eighth of an ACE unit in that time. 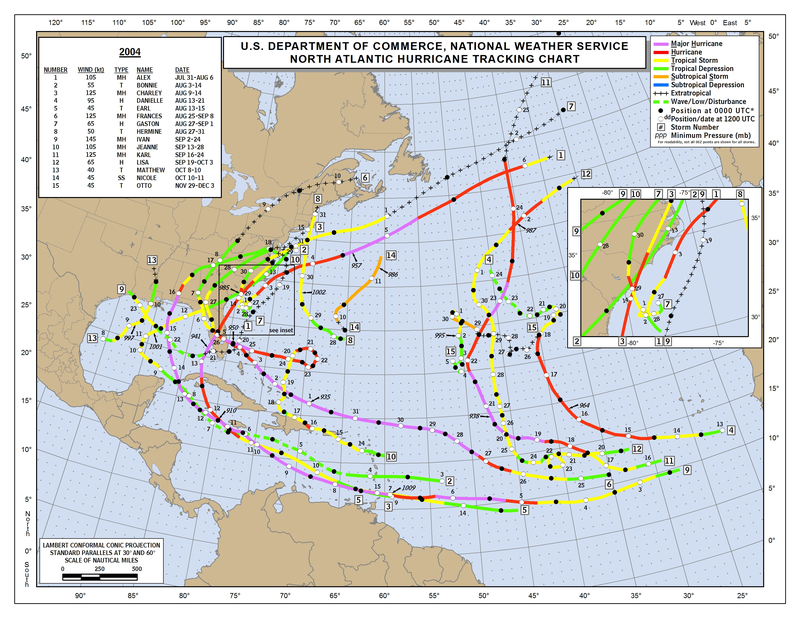 In aggregate, Atlantic tropical cyclones produce about 100 ACE units annually. 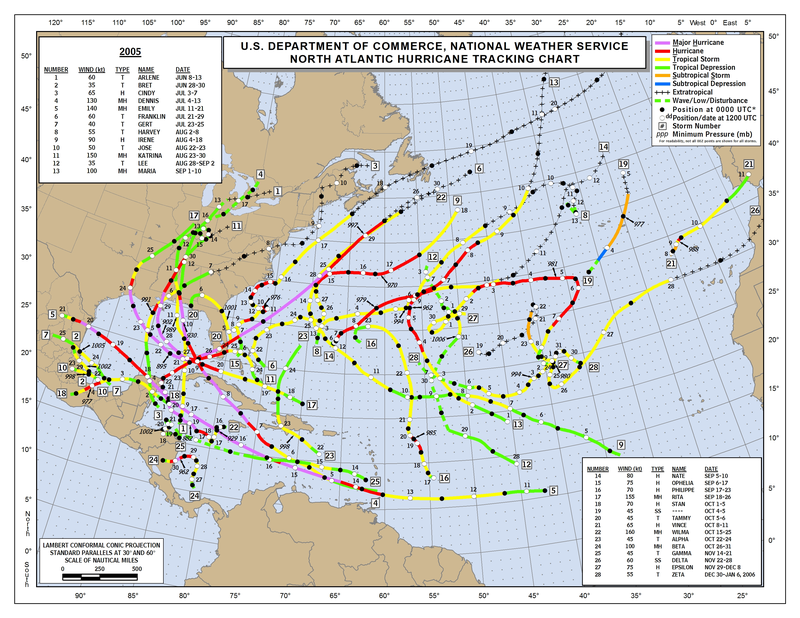 We used the National Hurricane Center's Best Track data set of historical storm positions and intensities to tabulate the cumulative ACE occurring over or close to the continental United States each year. This "landfall ACE" is a more meaningful way to capture the net impact of tropical cyclones than counting landfalls, as it avoids the influence of arbitrary thresholds, and more heavily weights storms like Harvey that remain destructive for long (in Harvey's case, absurdly long) periods after moving inland. Landfall ACE has averaged 3.7 ACE units since the start of reliable historical records for U.S. impacts. By this deeper measure, tropical cyclone activity over the continental U.S. is at an ebb in historical terms. The 10-year moving average of landfall ACE averaged just over 2 units during 2006-2015. There was a slight uptick last year due to Hurricanes Hermine and Matthew, but before Harvey's landfall, landfall ACE remained at less than 60 percent of the long-term average over the past decade, or just one-third of the maximum values recorded in the 1940s. A few other periods in hurricane history did record slightly lower landfall ACE, with a minimum average of about 1.75 units over 1973-1982. However, this coincides with the cool phase of the Atlantic Multidecadal Oscillation between 1970 and 1994, during which all tropical cyclone activity across the Atlantic Basin was generally suppressed. Notably, mean landfall ACE for 1970-1994 and 2006-2016 are comparable despite the average season in the latter being nearly 50 percent busier than the former. Framed in this way, the relative calm along U.S. coastlines in the past decade-plus is unprecedented. Given the powerful and long-lasting impact from Harvey and the large contribution from Hurricane Irma, landfall ACE is likely to be considerably elevated for the 2017 hurricane season. Bottom line: The just-ended U.S. landfall drought has few historical precedents, and the United States may not enjoy a similar period of tropical luckiness for some time to come. Erica Staehling is director of research and development at WeatherTiger. She has a BS in physics and mathematics from Bucknell University, an MS in curriculum and instruction from Florida State University, and a PhD in atmospheric and oceanic sciences from Princeton University. Ryan Truchelut is chief meteorologist of WeatherTiger, a weather consulting and seasonal forecasting company. An experienced hurricane researcher, he has a BS in geoscience from Princeton University and a PhD in meteorology from Florida State University. Follow: @wx_tiger. What's driving our major hurricane landfall drought? Study says it's just dumb luck.